The Last Fiesta: One of Chris' latest works sprouted after a trip to Tijuana, where apparently their lucha libre masks go hand-in-hand with religious landmarks (or at least're seen next to each other on the street). 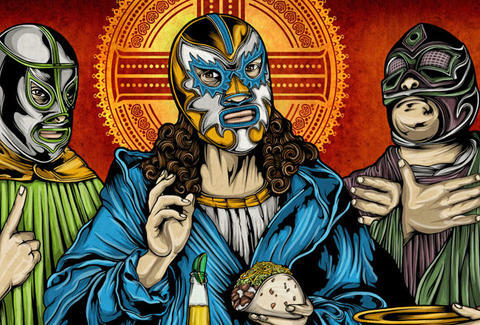 Fiesta -- originally painted on 12 skateboard decks but now available through May 23rd in a two and a half-foot-wide print -- gives us Jesus hosting his lucha-masked apostles at a taco-heavy Last Supper as he gets down with a Corona, apparently unconcerned about its effect on his Simon Peter. Graphic Tees: These guys come in several varieties including the Fiesta-inspired "Christos Mysterio" (a blue-tinted Jesus holding a taco), as well as a gun-wielding, sombrero-sporting skeleton "Mariachi", and "Serpanther", also what Jimmy Clausen asked people to call him, because one of his grandparents visited England. Throw Pillows: Chris also creates limited-edition, double-sided throw pillows, with new pieces slated to drop in the next couple weeks modeled after the ones used in Bali's sacred dances and ceremonies, and boasting a male or female wooden mask on the front, although on this, the day of your daughter's wedding, may your first mask be a masculine mask.